As of June 2013, Interstate 74 exists in three sections in North Carolina: (1) near Mount Airy, (2) from Interstate 40 at Winston-Salem south to Ellerbe, a portion of which is concurrent with Interstate 73, and (3) between Laurinburg and Lumberton. Additional miles are planned in the coming years, even though it may be decades before North Carolina’s Interstate 74 connects with Interstate 74 in the Midwest. Interstate 74 was first proposed for extension into West Virginia and the Carolinas with the passage of the National Highway Designation Act of 1995. While the original Interstate 74 still ends in Cincinnati, it is unlikely that the freeway will continue east toward Huntington, West Virginia, any time soon. At the same time, Interstate 74 is not signed in either Virginia or South Carolina either. 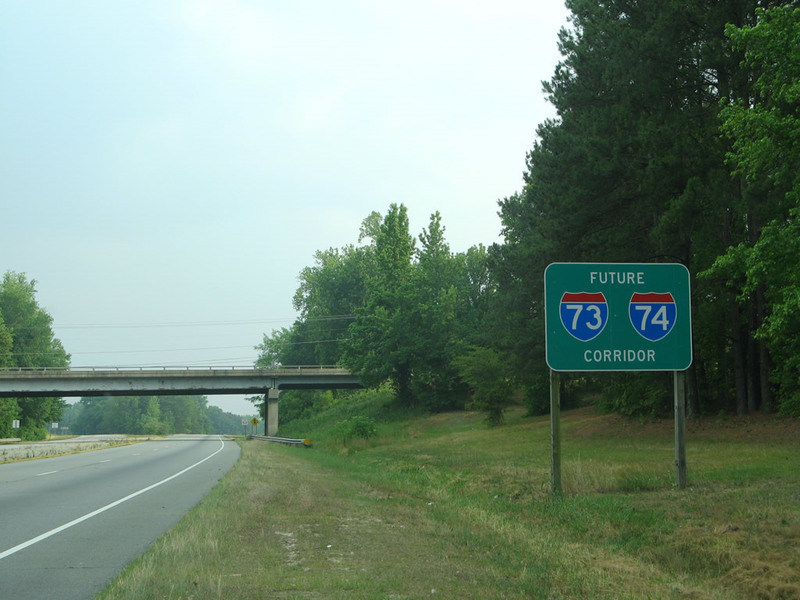 The first section of Interstate 74 in North Carolina follows the 13-mile Mount Airy bypass east from Interstate 77 near the Virginia state line. South of Toast and Mount Airy, this segment of Interstate 74 through Surry County opened initially between I-77 and U.S. 601 on July 14, 19981 and from U.S. 601 to U.S. 52 on July 1, 1999. Construction on the $78.8-million roadway took eight years.2 Reassurance markers for I-74 were placed along the freeway (signed originally as North Carolina 752) by 2001. Cosigning of Interstates 74 & 77 along their 4.6-mile overlap occurred in April 2001. Future Interstate 74 Corridor signage remains in place on U.S. 52 between the east end of the Mount Airy section to northern reaches of Winston-Salem. This section of freeway will receive I-74 shields upon upgrading to full Interstate standards. The most recent section of Interstate 74, opened on June 7, 2013 at a cost of $99.7-million, joining the freeway end at Glenola with Interstate 73 at Randleman.8 This completes Interstate 74 between Forsyth County and Ellerbe in southern North Carolina, which doubles as U.S. 220 south from Randleman. U.S. 220 was redesignated as Interstates 73 & 74 in the mid-1990s from U.S. 64 at Asheboro southward to Candor. The 12.6-mile stretch from Ulah through Seagrove opened on August 27, 1996 at a cost of $47.5-million.9 The freeway north from U.S. 64 at Asheboro to Randleman was signed as Future Interstates 73 & 74 until the June 2013 opening of the stretch northwest to High Point. 17 miles of new freeway for U.S. 220 opened south from Candor to Ellerbe on January 7, 2008.10 This portion, while built to Interstate standards, was signed as a Future route until March 2013.3 Future corridor signs accompany the non-freeway portion of U.S. 220 southward from Ellerbe to the north of Rockingham. A portion of U.S. 74 remains an at-grade highway between the Hamlet bypass and the Laurinburg Bypass. West of Laurinburg, U.S. 74 upgrades to a freeway east to Maxton. The initial 14 mile segment is designated Future I-74, awaited planned upgrades to Interstate standards, estimated for 2027 and beyond. Interstate 73-74 Future Corridor sign posted on southbound U.S. 220 after the Midway Road off-ramp in Rockingham, North Carolina. Photo taken 05/30/07. Right of way acquisitions have already taken place for the new 10.5-mile link between Interstates 73 & 74 south of Ellerbe and the west end of the Rockingham Bypass (U.S. 74). New I-73 & 74 will veer southwest from U.S. 220 at Northside Drive to combine with U.S. 74 at its split with U.S. 74 Business. Approaching the Laurinburg bypass in this scene, a greenout concealed East with Future for I-74. Photo taken 07/28/13. U.S. 74 shifts onto the Laurinburg bypass freeway just east of the J-turn intersection with SR 1321 (Elmore Road). The Laurinburg bypass was initially signed as Interstate 74. Photo taken 07/28/13. A $7.5 million project was awarded in October 2017 for the conversion of the intersection at U.S. 74 and Broadridge Road in Robeson County into an interchange. Associated work reconfigures the intersection with Creek Road, 1.5 miles to the south, into a directional crossover. The two-year project started after November 27, 2017.19 Beyond Robeson County, U.S. 74 angles southeast to Chadbourn, where the route combines with U.S. 76 for a bypass of Whiteville. At Chadbourn near the current intersection of U.S. 74 and U.S. 76, a proposed but unlikely easterly extension of Interstate 20 was slated to tie into Interstate 74. 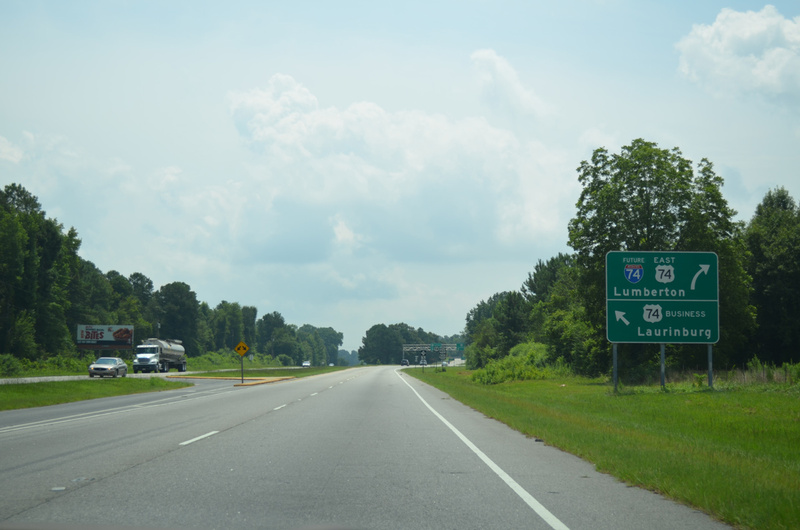 I-20 ends in Florence, South Carolina but was envisioned to combine with I-74 between Chadbourn and Bolton via Whiteville en route to a proposed end at Wilmington. The governor of North Carolina introduced the new routing of Interstates 20 and 74 in his Strategic Transportation Plan for Southeastern North Carolina on May 5, 2003. Plans for the eastern terminus of Interstate 74 have changed substantially since 1995, when Interstate 74 was proposed to be extended east. The original ISTEA/NHS legislation indicated that Interstate 73/74 would have continued beyond Georgetown southwest into Charleston, but that was removed (per the TEA-21 law passed in 1998). North Carolina’s two sections of Interstate 74 are part of High Priority Corridor 5: I-73/74 North-South Corridor. Its designation in North Carolina is written into law. Establish Interstate 74 – “Beginning at the intersection of Interstate Route 77 at the Virginia State Line, then southerly over I-77 to the intersection of U.S. 52 south of Mount Airy, then southeasterly over U.S. Route 52 to the intersection of U.S. Route 311 in Winston-Salem, then easterly and southeasterly over U.S. Route 3111 to the intersection with U.S. Route 220 in Randleman, then southerly over U.S. Route 220 to the intersection of U.S. Route 74 in Rockingham then southeasterly over U.S. Route 74 to the intersection of U.S. Route 76 in Whitehall, then westerly over U.S. Route 76 to the South Carolina State Line.” The action to establish this route was continued at the April 1996 meeting, and it was subsequently amended in future iterations by North Carolina and adjacent states. Interstate 74 extends 3.8 miles east from I-95 & U.S. 301 to end at N.C. 41 on the southwest side of Lumberton. Photo taken 07/28/13. An end shield for Interstate 74 stands just beyond the diamond interchange (Exit 213) with N.C. 41. The freeway continues another six miles to Broadridge Road (SR 2220), where a grade separation is under construction through 2020. Photo taken 07/28/13. U.S. 74 travels northwest from the partition with U.S. 76 near Chadbourn and across the Lumber River to upgrade into a freeway six miles south of North Carolina 41 (Exit 213). Photo taken 07/28/13. Beyond Exit 213 for N.C. 41 north to Lumberton and south to Fairmont, Interstate 74 begins and accompanies U.S. 74 west toward Maxton and Laurinburg. Photo taken 07/28/13. Interstate 74 east merges with the U.S. 52 expressway extending south from Mount Airy at the trumpet interchange (Exit 17). U.S. 52 represents the future I-74 corridor south to the Winston-Salem Northern Beltway. Photo taken 10/05/01. An end sign marks the conclusion of the 12-mile segment of I-74 east from Interstate 77 to U.S. 52. Photo taken 10/05/01. One mile south of the future split between U.S. 52 north and Interstate 74 west at the Armstrong Road (SR 1822) overpass. Photo taken 10/05/01. A third northbound lane opens just ahead of the separation of U.S. 52 with the Mount Airy Bypass (Exit 140). Whenever upgrades are made to U.S. 52 north from Winston-Salem, the exit number will switch to U.S. 52. Photo taken 10/05/01. The western segment of I-74 bypasses the south side of Mount Airy to White Plains, Red Brush and I-77 near Pine Ridge. Photo taken 10/05/01. Sign replacements made at Exit 140 by 2010 removed the word TO from ahead of Wytheville. I-74 accompanies I-77 north a short distance to end at the Virginia state line while U.S. 52 continuing to a business/bypass separation through Mount Airy. Photo taken 07/09/10. End shields for Interstates 73 and 74 posted near the south end of the U.S. 220 freeway, four miles beyond the original freeway end at Candor. Traffic from U.S. 220 Alternate, the pre-freeway route of U.S. 220 through Biscoe and Candor, returned to U.S. 220 ahead. Photo taken by Chris Patriarca (08/16/03). U.S. 220 transitions from an at-grade highway northward from Rockingham to Interstates 73 & 74 at the diamond interchange with U.S. 220 Business south of Ellerbe. Begin shields for I-73/74 were added here by 2014, with the exit renumbered from 8 to 25. Construction underway to April 2018 upgrades a three-mile stretch of U.S. 220 here to freeway standards. Photo taken 12/21/08. The final confirming marker for I-74 west stands within the median of Interstate 77 beyond milepost 102. The pair advance north 2.9 miles to the Virginia state line, where I-74 formally ends. Photo taken 09/23/14. Interstate 74 appears along side Interstate 77 south just beyond the Virginia state line. Virginia has no plans presently to extend the I-74 signing northward at this time. Photo taken by Mike Muiznieks (12/01). The first in a series of guide signs, since replaced, outline the forthcoming three-wye interchange (Exit 101) for the eastbound split of I-74 from Interstate 77 south. Photo taken by Jeff Morrison (08/07/05). Two lanes depart from the left-hand side of I-77 south for the 12-mile segment of I-74 east to Mount Airy and U.S. 52. Photo taken by Jeff Morrison (08/07/05). Interstate 77 continues south to Statesville and Charlotte while Exit 101 departs for I-74 east to U.S. 52 for Winston-Salem. This section of Interstate 74 was signed solely as North Carolina 752 until 2001. Photo taken by Jeff Morrison (08/07/05). Interstate 74 was extended westward along the U.S. 311 freeway from High Point to Forsyth County in March 2013. I-74 will turn north on the Winston-Salem Beltway eventually, but ends at I-40 for now. Photo taken 07/09/10. A wide trumpet interchange (Exit 55) joins I-74 with Interstate 40 in southeast Winston-Salem. U.S. 311 formerly overlapped with I-40 west to U.S. 52 north to Downtown Winston-Salem. Photo taken 07/09/10. 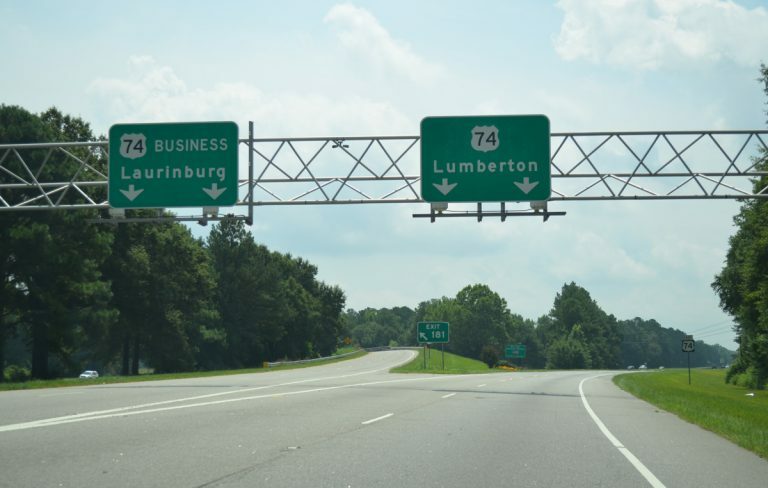 The Laurinburg and Maxton bypasses for U.S. 74 remain a part of Future I-74 until upgrades to Interstate standards are made. I-74 resumes east of the six-ramp parclo interchange (Exit 194) with U.S. 74 Business west back into Maxton. Photo taken 07/28/13. “I-77 Link Means Lost Business, Owners Fear.” Winston-Salem Journal, July 11, 1998. “Ready to Road Test Long-Awaited Connector to I-77 is Expected to Open Today.” Winston-Salem Journal, July 1, 1999. “Road to the future.” Winston-Salem Journal, March 4, 2013. “THE ROAD LESS WANTED – NOT EVERYONE ENJOYED THE VIEW WHEN A KEY HIGHWAY OPENED FROM HIGH POINT TO WINSTON-SALEM 20 YEARS AGO.” Greensboro News & Record, February 29, 2004. “NEW U.S. 311 BYPASS UNVEILED.” Greensboro News & Record, September 19, 1997. THE REAL DEAL ON THE NEW BYPASS.” Greensboro News & Record, November 20, 2004. “I-74/U.S. 311 bypass opens.” WMBF News, November 22, 2010. “Final Section of U.S. 311 Bypass Opens in Randolph County.” North Carolina Department of Transportation, press release. June 7, 2013. “U.S. 220 Widened Near Seagrove.” Greensboro News & Record, August 28, 1996. SCDOT – Inside SCDOT – Carolina Bays Parkway http://www.dot.state.sc.us/Projects/CarolinaBays/default.html. SCDOT. “The Drive Behind New Highways.” Sun News (Myrtle Beach, SC), December 18, 2002. “Drivers May Cruise To S.C. 544.” Sun News (Myrtle Beach, SC), December 15, 2004. “Official: Ground breaking for S.C. 707 widening and S.C. 31 extension to restore faith in the system.” Sun News (Myrtle Beach, SC), November 6, 2013. “Re: Interstate 73/74” online posting by bob7374, AARoads Forum, November 19, 2015. “State Continues to Improve U.S. 74 in Robeson County.” North Carolina Department of Transportation (NCDOT), news release. November 2, 2017. “Carolina Bays Parkway Extension study begins.” StarNews (Wilmington, NC), September 13, 2017. “Construction Starting on Additional Section of Northern Beltway.” North Carolina Department of Transportation (NCDOT), news release. December 6, 2017. “Re: Interstate 73/74” online posting by bob7374, AARoads Forum, December 21, 2017. “Re: Interstate 73/74” online posting by bob7374, AARoads Forum, January 8, 2018.